The Lhasa Apso is a small, well-muscled hardy little house dog originating in Tibet and is thought to be descended from the type of dog common for centuries over Central Asia. The name Apso is used in Tibet for both of their smaller longhaired breeds and means longhaired or goat like. 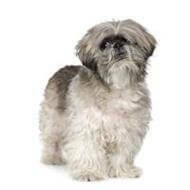 Lhasas have been known to live up to 17 years of age. Very good, but being an assertive breed they like to show dominance over other dogs and so care should be taken if introducing another dog into the family. The coat is double with a moderate undercoat that provides good insulation that is cast out for summer when a thinner undercoat grows. The topcoat is of a hard texture and serves as a weatherproof outer jacket. The good fall of hair over the eyes is protection against dust, wind and intense glare found in the Tibetan climate. Regular grooming is a necessary task, providing the essential bloom in a long coated breed, but the task can almost be made a game for both the owner and dog. They can be also clipped and look just as adorable. Being a small dog they are ideal for the metropolitan area, but they are by no means softies, they are an all weather strong breed but they do like to be indoors. Years of close contact with people in the temples and as a house dog has developed their lovable personalities. They are highly intelligent, good with children, assertive with a free and jaunty movement, but wary of strangers and can be sensitive to the moods of their owners.